There are a couple of differences. Don’t run this suppressor “wet” like the Mk-54. Rifle-sized pressures and operating “wet” don’t usually go together, at least not safely. 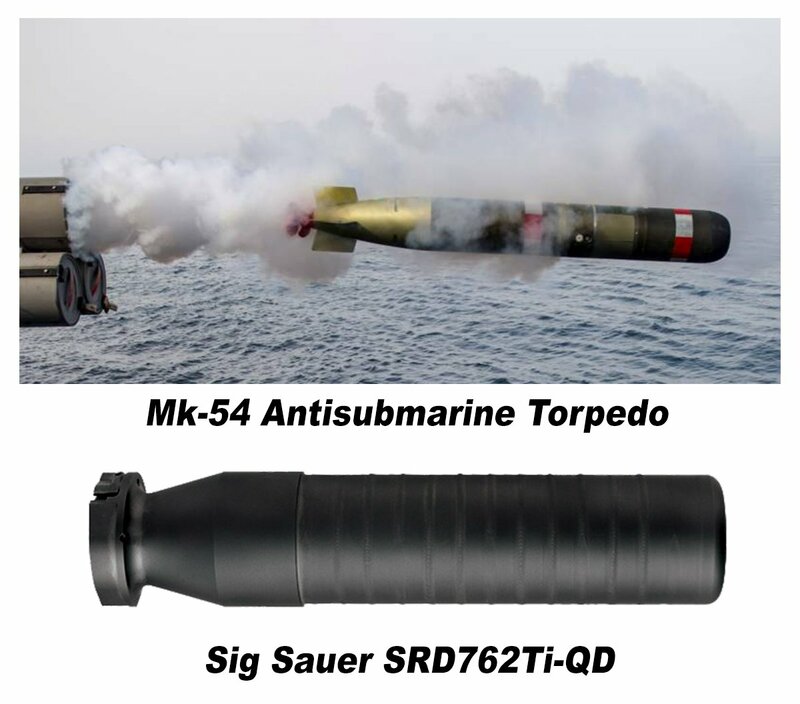 Another difference is that the Sig Sauer SRD762Ti-QD is noticeably lighter than the Mk-54, probably because of the use of Titanium. That and the much smaller size. Last, but not least, the Sig SRD762 is way quieter when it goes off. Oh, and as far as I know, the Sig SRD762Ti-QD doesn’t have a magnetic detonator either. Thanks to some help from our friends at Silencer Shop, I got my hands on a brand-spankin’ new SIG Sauer SRD762Ti-QD suppressor for some serious fun (work and highly scientific testing.) As the name implies, this is a .308 / 7.62mm suppressor, but it’s rated for up to 300 Win Mag and any other cartridge that has same or smaller diameter and pressure. Sig offers two different designs of the SRD762 suppressor and two different mounting systems, so in total there are four different models in the SRD762 family. There is a standard SRD762 and an SRD762Ti. The standard model is made from Inconel 718, a Nickel Alloy Stainless Steel. The “Ti” model uses Titanium as the name implies. Basically, you’ll want to choose the Iconel version for heavy and abusive use. The Titanium model uses lighter material so it can be a bit bigger without making the suppressor heavier. Bigger means more air inside, which means less pressure and less noise. Make no mistake, the Titanium version is plenty durable, but if you’re going to use it in a sandbox, maybe choose the Iconel model. Both models are available in fixed thread mount or QD (quick detach) mount configurations. The new QD system is pretty darn clever, and we’ll get into that more in a minute. The fixed thread models of the SRD762 models use ⅝-inch x 24tpi threading. Due to the different combinations of materials and mounting systems, the four models have different dimensions and sound suppression performance. Here’s a quick summary. 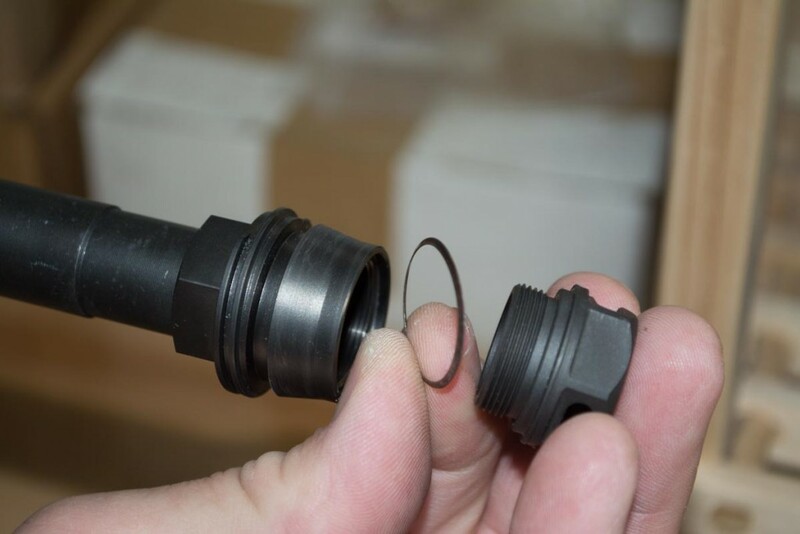 Most suppressors have a series of baffles that are assembled and then placed inside of an exterior sleeve or tube that contains everything and holds the system together. Many rifle suppressors are permanently constructed this way to handle the crazy high pressures of rifle cartridges. The result is that part of the assembly, and associated weight, serves no real purpose other than structural support. Additionally, the space used by the support tube means less sound-suppressing interior volume inside for any given exterior size. From a pure noise-reduction perspective, the bigger you can make the interior volume, the better. The QD package mount system is actually two pieces – the suppressor mount itself and a muzzle brake insert. 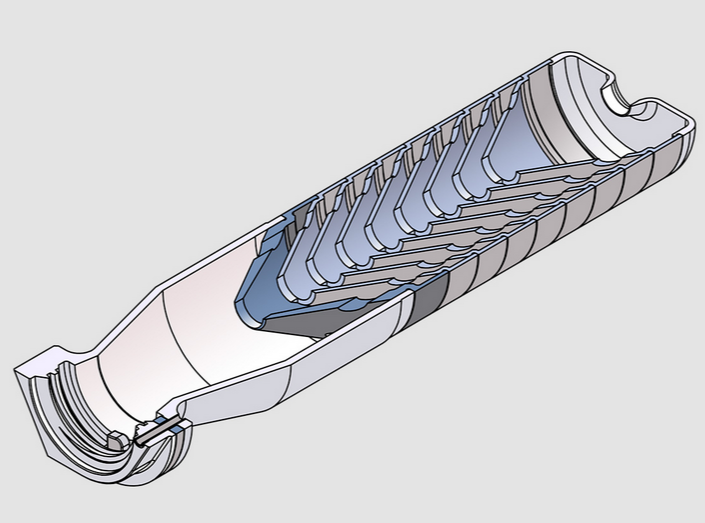 The idea is that by constructing the entire silencer completely from the baffles, there is more space for air inside and less weight allocated to structural support only. This is why you’ll see a series of ridges all along the suppressor exterior. Those are the weld joints where the baffle rings are attached to each other. It’s a clever idea. Plus, it looks kind of cool. The weld joints are perfectly uniform, so they don’t look like weld joints. They look more like some form of decorative texturing pattern. The suppressor body is made of a stack of baffle rings welded together. The blast chamber at the base is made from one solid hunk of metal and the baffle rings extend from there forward. The mounting system on this suppressor is, well, brilliant. Here’s why. Direct-thread mount systems are easy and stable. You just screw it onto a threaded barrel and start shooting. The downsides are that it doesn’t come on and off easily and your point of impact may vary between on and off episodes as the silencer mounts a little differently each time. Of course, if you leave a suppressor on one rifle forever, this is a moot point, assuming you don’t remove it for cleaning or maintenance. Direct-thread mounts also do a good job of keeping the suppressor perfectly aligned with the bore, so you don’t run the risk of a baffle strike. That’s when a very, very slight misalignment of suppressor and bore cause your bullet to whack the inside of the silencer on the way out. That’s bad, especially since you forked over a hefty price to the company, paid $200 in tax, and waited months to get it. Trust me, it a baffle strike totally ruins your day. Don’t ask me how I know. 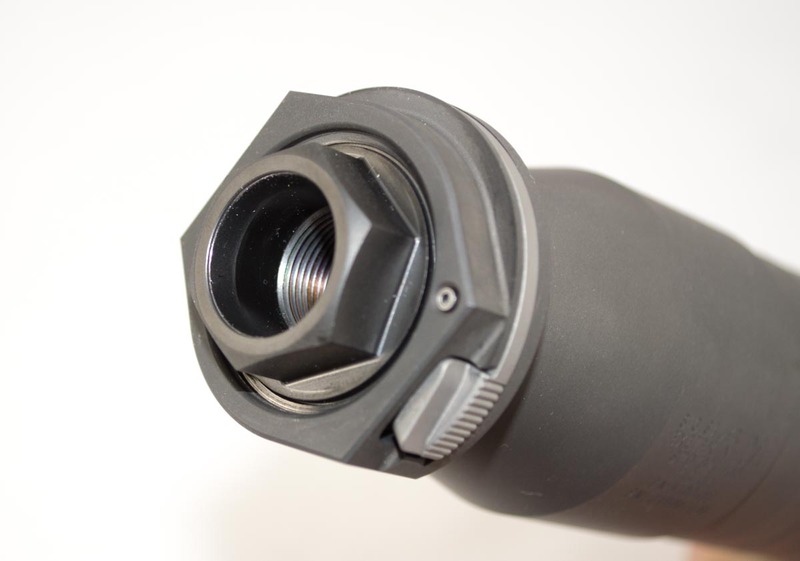 When using a direct-thread mount, make sure that your don’t use the crush washer that’s already likely between your barrel and existing muzzle device. Normally, crush washers are used to “time” muzzle devices like those A2 flash hiders that come on most AR-type rifles. By “timing” I simply mean alignment. The flat part of the muzzle brake needs to be facing the ground while the open slots face outward and/or up. The crush washer does just what is says, and compresses as you tighten the muzzle brake. It will let you keep turning, up to an additional full turn or more, once it’s tight so you can get perfect alignment of the muzzle device. Crush washers flex and give, and, therefore, open up the possibility of a baffle strike as they don’t provide for an absolutely square mount to the bore line. Make sense? When you use a suppressor that mounts on a special muzzle device like a flash hider or brake, you get a couple of benefits. First, it pops on and off easily so you can pack it in your bag or switch it between guns. You can shoot unsuppressed or suppressed at will. 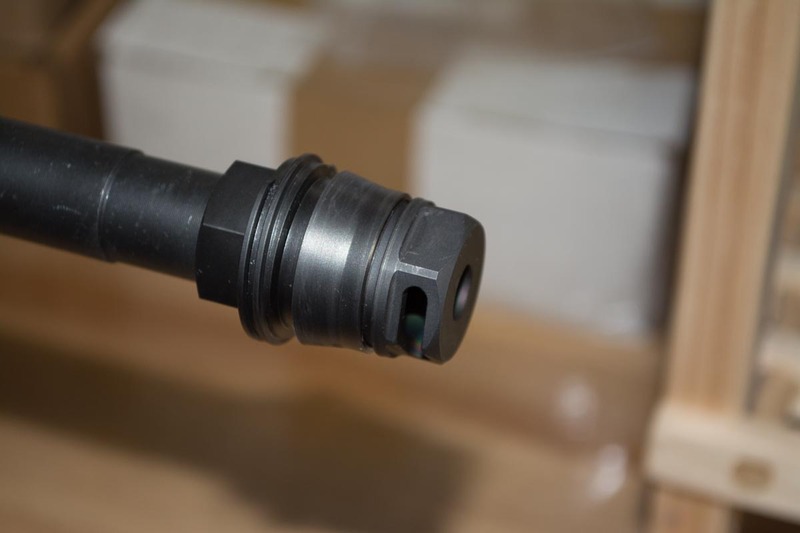 Second, When you remove the silencer, there is still a muzzle device there to protect the threads and do the things muzzle devices do like brake recoil and hide flashes. Third, a compatible mount and muzzle device keeps your suppressor aligned perfectly with the bore every time you install it, thereby preventing baffle strikes and keeping your point of impact consistent from session to session. Here’s the trouble with most suppressor mount systems. Unless you’re using a muzzle flash hider mount where orientation doesn’t really matter, you still have to time the suppressor mount and muzzle device so it’s aligned correctly. You can’t use the normal system, a crush washer, for the reasons we just described. Instead, you use one or more flat washers of different thickness so that when you tighten the muzzle device down, it’s in the correct orientation. This is kind of kludgy. Here’s what Sig did to make a better mousetrap. The suppressor mount and muzzle device are separate, so there are three pieces at play: the mount, the muzzle device, and the suppressor itself. The mount has no specific orientation. Just remove all washers from your threaded barrel, degrease everything, add a little Rocksett, and screw it on tight. It’s symmetrical all around, so, however, it lands on the threads is fine. The muzzle device screws into the interior of the suppressor mount. You can change muzzle devices without moving the suppressor mount at all. Sig offers a variety of muzzle devices that fit into the suppressor mount so you can decide if you want a muzzle brake or flash hider. Since some of those devices need to be timed (oriented properly), you insert a large crush washer between the suppressor mount and muzzle device. That works because when you mount the suppressor, it only contacts the suppressor mount and not the muzzle device. The muzzle device just slips inside of the suppressor body. There is no risk of the crush washer causing misalignment baffle strikes because it plays no direct role with how the suppressor is mounted. The mount itself is already installed on the rifle barrel. Muzzle devices are just inserts that fit into the mount. The bottom line is that you get a quick attach and detach mount. The suppressor goes on the same way every time and in perfect alignment. You can do whatever you want with Sig Sauer compatible muzzle devices without worry of impacting suppressor alignment. It’s simple but brilliant. Large threads allow the suppressor to screw on to the QD mount with two turns. A locking tab makes sure it won’t come off during use. Just press the locking tab before removing the suppressor from the mount. The Micro-Brake installed into the suppressor mount. While we’re on a suppressor mount epistle, I should mention one more thing about the suppressor mount system. It uses the new Taper-Lok system. The complete system includes a threaded barrel with a tapered section behind the threads. The mount has a mirror image taper and thread pattern. The barrel and mount pressure fit together via the tapered sections and lock with the threading. If your barrel has no tapered section, that’s fine too, the tapered section within the mount just presses over the ridge at the base of the threaded section. The idea is a more solid and perfectly straight mount that won’t easily loosen. Sig says that it takes 20% more force to remove the mount than to apply it due to the effect of the taper, so the devices are more likely to stay in place through heavy shooting. OK, so that was a lot of explanation, but the whole approach to the mount system is one of the biggest areas of different with the Sig suppressor line. I tested this model on a Daniel Defense DDM4V5 300 Blackout rifle, mainly because I wanted to hear the sound of the bolt operating. Just kidding, but when I did start shooting Sig Sauer 220 grain subsonic 300 Blackout ammo, that was the loudest noise – the bolt moving back and forth. Whoa! That was cool and got major attention at my outdoor range. The even better part was the relative instability of those big, lumbering 220 grain subsonic bullets. As soon as they struck a target, they would tumble and go whizzing off into the backstop making all sorts of awesome sound effects. I also shot a variety of 300 Blackout supersonic ammo. Of course, the sonic crack is still there, but that’s moving away from you. The suppressor did a fine job of negating the muzzle blast, so the shots sounded more like compressed air being released from a tank from the shooters position. The suppressor body locks onto the mount with a locking tab. Just press and you can then unscrew the silencer from the mount. One thing I did notice was a significant tightening of groups when I mounted the suppressor. I set up a target 100 yards down range and fired groups with both supersonic and subsonic ammunition with only the Micro-Brake muzzle device in place. I then screwed on the suppressor and reshot groups. Both super and subsonic groups were noticeably tighter when shooting suppressed. I also took this opportunity to check for point of impact shift between suppressed and unsuppressed shooting. For the supersonic ammo I was using, there was about a one-inch vertical shift in point of impact downward when I added the suppressor. For the subsonic ammo Sig Sauer ammo, there was about a ½-inch shift to the right at 100 yards when I added the silencer. I like this silencer, especially the mounting system. The QD mount is forgiving when crud starts to accumulate, so you’ll still be about to mount and un-mount it without undue effort. The separate muzzle device and suppressor mount design is a great idea and works really well. Check Silencer Shop for street prices and availability. Previous post: Where Do You Draw the Line on the Personal Ownership of Weapons? Any issues with cleaning the 762Ti-QD? I just bought this suppressor for my 300Blk SBR. I also bought the 3 fingered flash suppressor vice the micro brake that comes with the suppressor. Install seemed easy enough. But, when you put the crush washer on, and then install flash hider, and time it, it isnt real tight. Is this okay, or am I not installing the flash hider correct. I put it on, till hits the crush washer, them turn it by hand to time it so the flat is on the bottom to keep dust etc from flying up. Or is there another set of instructions to install this? What is the minimum 308 barrel length the srd762-ti qd is rated for? In speaking with SIG, there is no minimum length required for this suppressor on a 30 cal rifle (yes, even for the TI-QD). I was curious because I want to throw this on a 13″ scar and 14.5″ POF. The only minimum length outlined is for 5.56 which is 10″ or 12″. I wasn’t sure if it was reliable information so I called again the next day to speak to someone else and they re-stated this info. Hope this helps. The tightening of groups could be that you are just lucky in terms of barrel tuning. It could have been the opposite, also depending on your ammo. Remember the BOSS? Same concept with a much heavier weight at the end of the barrel. Some years ago, the NRA’s Rifleman ran an article about the early attempt to promote suppressors. The original explanation of how they work was that the muzzle blast was turbulent high pressure air, causing noise and bullet yaw. This yaw resulted in reduced accuracy and velocity. The higher the pressure, the greater the benefit of a suppressor. The demonstration rifle was a Browning BAR in 30-06 ( I think they wanted to sell to the US Army). They fired down a country road with telephone poles along one side (different world back in the 1920’s). The sonic boom was heard as the bullet passed each pole. That would make determining where the shot came from more problematic.